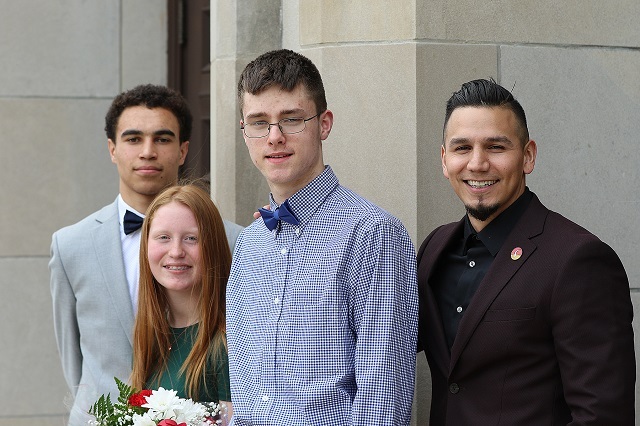 Three Mooseheart High School students – Amanda Jones, Wendell Lanphear and Joey McCrea – joined the National Honor Society (NHS) on Wednesday, participating in the timeless rituals of candle-lighting and pledge recitation that mark entry into a society that honors scholarship and citizenship. Seniors Lanphear and McCrea and junior Jones entered Mooseheart’s long history with the NHS. Mooseheart’s chapter was the fifth in the U.S. and the first in Illinois when it was founded in 1921. Since inception, Mooseheart has inducted 450 students into the NHS. Each of this year’s students has plans for projects they wish to implement to carry on the mission of the NHS, which has four pillars – Scholarship, Leadership, Service and Character. Jones said she hopes to start a NHS club at Mooseheart; a club “that will consist of high school students who possess the qualities of an NHS member. McCrea said he has plans to hold a day of poetry at Mooseheart to allow students to “use a voice they didn’t know they had.” Lanphear, who is a participant in the Big Brother Big Sisters program, said he hoped to organize a Big Brother Big Sister event before the end of the school year. The event’s guest speaker was 2002 Mooseheart graduate and NHS member Paul Morgan, who grew up on Chicago’s South Side before he attended Mooseheart. He earned his bachelor’s degree from the University of Illinois and has since earned his master’s degree and served in the Marine Corps. He is now the Director of Programs and Innovation for the Daniel Murphy Scholarship Fund in Chicago. Morgan said one of his fondest memories from Mooseheart was of the love he saw one of his classmates receive from a sponsoring lodge. This is the link between all Mooseheart students, though not all feel that link as tangibly as Morgan’s friend, whose name he did not divulge. This friend graduated from Mooseheart, served in the Marines like Morgan and is now working on his master’s degree. “That is why this place is so special, the fact that the men and women of the Moose have nothing but love and affection for the students that they serve. I am happy to share that my dear friend found safety, acceptance and love with his family at Mooseheart,” Morgan said.